Our group focuses on using imaging techniques in small-scale trials with the particular ambitions of improving the mechanisms of data analysis and correlating the imaging data provided with histology and treatment outcomes. methods for data analysis. There is also a significant amount of data available from current imaging techniques already in use that may potentially be used as a prognostic biomarker, predict treatment response, and modify treatment. We have focused on a small number of different areas: angiogenesis imaging using dynamic contrast enhanced MRI and perfusion CT, dynamic FDG PET imaging, and the novel 18 F PET integrin imaging agent fluciclatide. 18 F fluciclatide PET-CT images of a patient with bilateral scapula bone metastases from renal cancer. Image A is pre-antiangiogenic therapy demonstrating active angiogenesis at the edge of the metastases. Image B confirms the anti-angiogenic effect of treatment with decreased integrin activity at the sites of pre-treatment avidity. We have also developed novel data analysis techniques for use in hyperpolarized xenon MRI. 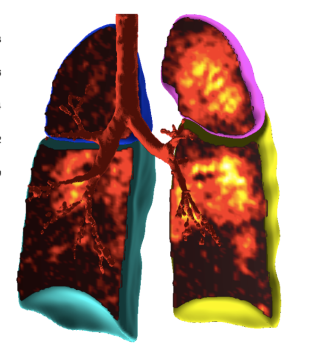 Trials in normal healthy volunteers, patients with COPD and lung cancer are currently underway, and have enabled us to develop methods of lobar analysis of ventilation and emphysema correlated with CT and pulmonary function. The aim is to develop an imaging tool that would, for instance, predict the change in lung function following lobar resection or following radiotherapy. The impact of heterogeneity and uncertainty on prediction of response to therapy using dynamic MRI data. 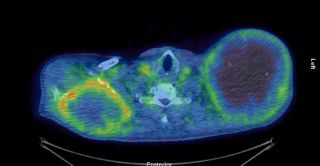 Differences in the biologic activity of 2 novel MEK inhibitors revealed by 18F-FDG PET: analysis of imaging data from 2 phase I trials. 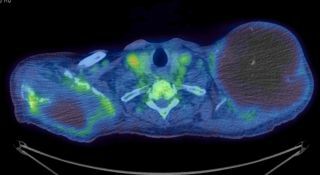 Metabolic response at repeat PET/CT predicts pathological response to neoadjuvant chemotherapy in oesophageal cancer.